Our first reading is the call of Isaiah to prophesy to the people of Judah. The scene is the throne room of God and the mood is one of sheer awe. In the face of God’s holiness, Isaiah can only shrink back. Yet the mercy of God shines through and Isaiah is then able confidently to answer the call. 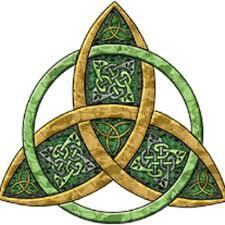 This reading is chosen for Trinity Sunday because of the curious, “Who will go for us?” Why the use of the plural? Christians have seen it as a foreshadowing of the Trinity (see a similar use at Genesis 1:26). The text of this canticle is The Prayer of Azariah & the Song of the Three, 29-34. It is found in the Book of Common Prayer as Canticle 13 (p. 90). It is taken from the apocryphal additions to the book of Daniel (inserted between 3:23 and 3:24). This text is a portion of the song the three young men sing in the fiery furnace. The entire song is 40 verses long. The final verse below is a Christian addition. Psalm 29 is an obvious psalm in response to our first reading, especially due to verse 9. The heavens open and the voice of God rings through the whole creation, over whom the Lord is sovereign. One thing that distinguishes this psalm is its use of the divine name “Yahweh” (translated, “the Lord”) 18 times. In addition, the term “voice” is heard seven times. It’s a reminder that the psalms are poetry! In chapter 8 of Romans, Paul contrasts life “according to the flesh” with life “according to the Spirit.” Here he indicates the contents of the life of the Spirit: adoption as children of God, as God’s Spirit is united to our own and we are able to cry to God as an intimate familiar (“Abba” is the Aramaic word for “father.”). Our deep sharing with Christ in the Spirit means, however, a sharing in his suffering as well as his glorification. 8:12 So then, brothers and sisters, we are debtors, not to the flesh, to live according to the flesh—13 for if you live according to the flesh, you will die; but if by the Spirit you put to death the deeds of the body, you will live. 14 For all who are led by the Spirit of God are children of God. 15 For you did not receive a spirit of slavery to fall back into fear, but you have received a spirit of adoption. When we cry, “Abba! Father!” 16 it is that very Spirit bearing witness with our spirit that we are children of God, 17 and if children, then heirs, heirs of God and joint heirs with Christ—if, in fact, we suffer with him so that we may also be glorified with him. In the context of Trinity Sunday, the story of Nicodemus’ meeting with Jesus takes on particular meaning. Although it cannot be used as a “proof text” for the doctrine of the Trinity, it does feed into it with all three persons of the Trinity present in the story. In this context as well, “being born from above” takes on the need for and promise of our sharing in the divine life. We are offered the opportunity to be caught up in the divine love that characterizes the relationship among the members of the Trinity. 3:1 Now there was a Pharisee named Nicodemus, a leader of the Jews. 2 He came to Jesus by night and said to him, “Rabbi, we know that you are a teacher who has come from God; for no one can do these signs that you do apart from the presence of God.” 3 Jesus answered him, “Very truly, I tell you, no one can see the kingdom of God without being born from above.” 4 Nicodemus said to him, “How can anyone be born after having grown old? Can one enter a second time into the mother's womb and be born?” 5 Jesus answered, “Very truly, I tell you, no one can enter the kingdom of God without being born of water and Spirit. 6 What is born of the flesh is flesh, and what is born of the Spirit is spirit. 7 Do not be astonished that I said to you, ‘You must be born from above.’ 8 The wind blows where it chooses, and you hear the sound of it, but you do not know where it comes from or where it goes. So it is with everyone who is born of the Spirit.’ 9 Nicodemus said to him, “How can these things be?” 10 Jesus answered him, “Are you a teacher of Israel, and yet you do not understand these things? 11 Very truly, I tell you, we speak of what we know and testify to what we have seen; yet you do not receive our testimony. 12 If I have told you about earthly things and you do not believe, how can you believe if I tell you about heavenly things? 13 No one has ascended into heaven except the one who descended from heaven, the Son of Man. 14 And just as Moses lifted up the serpent in the wilderness, so must the Son of Man be lifted up, 15 that whoever believes in him may have eternal life.” 16 For God so loved the world that he gave his only Son, so that everyone who believes in him may not perish but may have eternal life. 17 Indeed, God did not send the Son into the world to condemn the world, but in order that the world might be saved through him. The Scripture readings (except for the psalm) are from the New Revised Standard Version Bible, copyright © 1989 by the Division of Christian Education of the National Council of Churches of Christ in the U.S.A., and are used by permission. All rights reserved. The Psalm translation is from The Book of Common Prayer. Commentaries are copyright © 2018, Epiphany ESources, 67 E. Main St., Hornell, NY 14843, www.epiphanyesources.com. All rights reserved. Permission to copy and edit for church services and for group study is given, provided this attribution remains.